14d, SLINGSHOT [What some of the black squares in the grid might represent]. 16d, GOALPOSTS [Another thing they might represent]. 26d, TUNING FORK [Another thing they might represent]. 28d, THE LETTER Y [One more thing they might represent]. It’s a fun puzzle, but I think it would’ve been better suited to Wednesday. In fact, I did today’s puzzle faster than yesterday’s puzzle, which had a similar visual-element theme but also had the added wrinkle of requiring some mental arithmetic. I don’t have a lot to say about this one. 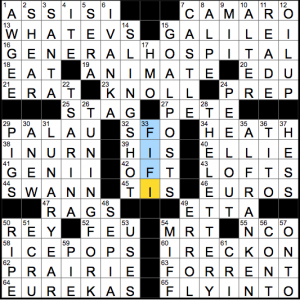 The odd symmetry and density of theme answers in the lower half of the grid requires a little bit of crossword glue, like REY and FEU and NCO and, elsewhere, ALPE. I imagine most people finished the grid with that little 3×4 box in the center of the grid, since the only way in is via the two northernmost theme entries. I didn’t know FIFI was a [Diminutive of Josephine], so I needed all the crossings there, but I liked learning that! Some nice fill elsewhere in the grid, like WHATEVS and GENERAL HOSPITAL and I RECKON. 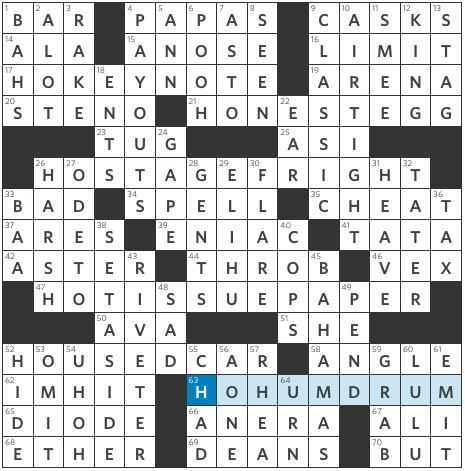 This is the third or fourth time in recent memory that I’ve seen an entry in the NYT puzzle that became unpleasant long after the puzzle was accepted but before the puzzle could go to print. Today, it’s [Senator in 2017 news] AL FRANKEN. I don’t know how else you might deal with cluing that entry without explicitly reminding solvers to the very bad things he’s done, other than (a) acting as if they hadn’t happened, which would be unacceptable, or (b) completely nixing the puzzle. 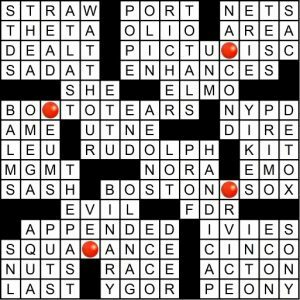 A cynical part of me wonders if this puzzle wasn’t expedited once Senator Franken’s misdeeds came to light, in order to go to print before more bad acts were potentially unearthed, or to avoid having to change the clue repeatedly (e.g., to “ex-Senator” when he steps down in two weeks). I dunno. This was a fine puzzle, if Wednesday-ish. I don’t think I’ll remember much about it except that AL FRANKEN and IVANKA Trump were in it. Happy end-of-Hanukkah, enjoy Christmas if you celebrate it, and I’ll see you all next week. Thursday: What else, but HO? Actually, HO HO HO HO HO HO. The letters H-O are prepended to six existing phrases. Pronunciations are changed as needed, but spelling is not. 21a [The very upright Humpty Dumpty?] HONEST EGG. Nest egg. 26a [Quaking of a kidnap victim?] HOSTAGE FRIGHT. Stage fright. Really? This is a very grim entry for a crossword puzzle, let alone a Christmas-themed puzzle. 47a [Report on a highly sought stock?] HOT ISSUE PAPER. Tissue paper. This is the only one that required re-parsing. 52a [Sedan in the garage?] HOUSED CAR. Used car. Meh. 63a [Bongo that’s boring?] HO-HUM DRUM. Humdrum. By far, the best entry of the lot. The rest didn’t do much for me, but this one is fun. 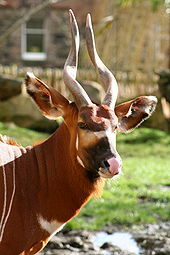 I had the antelope in my brain for a good while before I realized it was asking for a drum. With the rhyming revealers we’ve been experiencing all week, and with a title like “Ho Ho Ho,” I wanted each entry to keep that pronunciation. The first and last ones do, and I feel that makes them stronger than the others. The rest I could do without, especially HOSTAGE FRIGHT, which is such a complete turn-off. 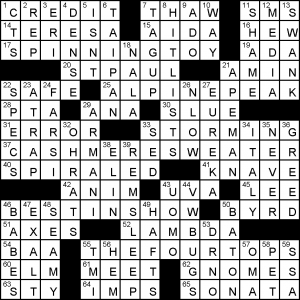 And with so much theme, there’s a good bit of crosswordese to match: plural BAHS, ELIHU Yale, ENIAC, A-ONE, and partials A NOSE, ODE TO, AN ERA, and AS I. I think this puzzle could have benefitted from fewer theme entries to allow more breathing room. I actually finished with an error. 36d is clued [Word after gift or sales]. With all the other Christmasy clues, I immediately plonked down TAG and never looked back. (The real answer is TAX.) Also, I didn’t know that a [Baseball dinger] is a TATER. But maybe that’s just me. Of course, there is some good stuff here, like CLASSIC, AIRTIGHT, PAYOUTS, RIVETER, and BAHAMAS. And some of the cluing is Thursday sharp, like 1a‘s [You might have a shot at it] for BAR and [In need of a lift] for SAD. But for the most part, for a puzzle titled “Ho Ho Ho,” this didn’t leave me with a jolly feeling. That’s all from me until next week. Please have a safe and joyful holiday weekend, whatever holiday you celebrate. And now, it’s time for some HODOR FRAMES. It’s still the holiday season, which means there’s still plenty of time for BEQ to find a new and interesting theme to stick in a puzzle. With “Guiding Light” as a title, it’s easy to figure out what: soap operas! Finally, SQUARE DANCE and VENOSE (an actual word that’s apparently the extreme form of venous) cross at the bottom. Please enjoy this off-brand animated Rudolph cartoon I got you from the internet dollar store. I started out lukewarm to this puzzle, SPINNINGTOY and ALPINEPEAK are descriptions, not crossword entries, but warmed more to it at the revealer, which was genuinely surprising and clever. THEFOURTOPS of Motown are used as a second definition of SPINNINGTOY, ALPINEPEAK, CASHMERESWEATER and BESTINSHOW. [Texting format, briefly], SMS – used as a verb here, though less so as Whatsapp takes over. I seem to recall this phenomenon is less common in the States. [Actress de Armas of “Blade Runner 2049”], ANA. New clue angle alert. [Key of Grieg’s only piano concerto: Abbr.] AMIN & [Grieg wrote only one for piano], SONATA. Erudite clechoing! [Schedules of items to deal with], HITLISTS. Yeah, that’s what hitlists are… Totally. [Hypothetical evolutionary link], APEMAN. Clue betrays dumbed down scientific misunderstanding. [“I don’t need the deets!”], TMI. Slang usage here is totes awks. This entry was posted in Daily Puzzles and tagged Alex Eaton-Salners, Brendan Emmett Quigley, Mike Shenk, Morton J. Mendelson, Natalia Shore. Bookmark the permalink. Shoutout to that themeless a couple weeks ago with DERNIER CRI – learning that helped a lot in the SE. Same here. When I encountered it in the themeless, it was so unfamiliar that I thought I must have some mistake[s] in my crossword, but this time I knew it! I liked this one overall. It was not brilliant, but it was solid. The theme wasn’t clever or tricky, but it was fairly fresh (to me, anyway—I don’t do the early days of the week) and very well executed, IMO, with everything fitting neatly into a mirror-symmetrical grid. Not a Thursday puzzle. Tuesday difficulty at most. Humorless concept. Poor fill. I love grid art! Enjoyed the puzzle. I have seen TATER before but I thought it meant “home run”. Is a dinger a home run? Yes. I knew dinger but not TATER. This week’s New York Times puzzles are brought to you by the number NINE and by THE LETTER Y. Another nominee for Comment of the Year. If there are awards for such things, 26-Down in today’s LA Times deserves a nomination for worst partial of the year (perhaps of the decade). NYT. Is anyone else bugged by the fact that the answer for 15D is plural? GOALPOSTS. Not especially, but I am bugged by the fact that WINEGLASS was not one of the theme answers. Andy, that little 3×4 box in the middle of the NYT puzzle was were I started, and my final entry was completing THE LETTER Y. Go figure! I liked it too, but it was easier than most Thursdays.